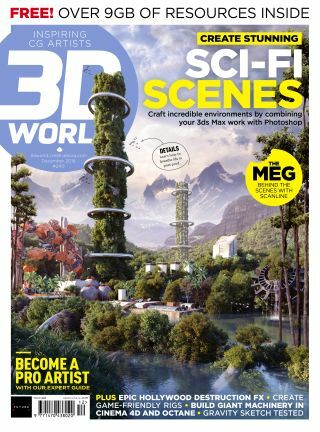 Get practical inspiration to help you be a better artist in the latest issue of 3D World. This issue, along with our usual reviews, inspiration and regular Q and A sections, we review Blackmagic Design's eGPU, teach you how to create monstrous machinery with Cinema 4D, and look at Gravity Sketch and GSG Light Kit Pro. Feature: Be a better pro! We talk to a group of seasoned pro artists to get their thoughts and tips on what has made them successful. Spoiler: It's not all about staying creative but about dealing with clients, time management, and so much more. In this feature we talk to the team behind the visual effects of The Meg, looking at their approach to not just the implementation but the design decisions behind creating such an epic monster. In this in-depth step by step tutorial, Oscar Juarez shows you how to use 3ds Max and Photoshop CC to create sweeping sci-fi vistas. Learn how to model, texture and light a scene, as well as use existing assets to populate your scene and tweak your renders in Photoshop. Creating industrial machines that are so detailed and of such a large size can appear daunting, but in this tutorial you'll learn the secrets to success, from using CAD data inside Cinema 4D to rendering using Octane. This tutorial will guide you, step-by-step, in the making of realistic destruction simulation, using 3ds Max, V-Ray and Rayfire. Buy 3D World 240 or subscribe to 3D World.